This is part 4 of a 4 part series on conversion optimization. For part 3 on Testing, go here. To begin the series with part 1 on Targeting, click here. By now you&apos;re feeling like a true CRO rockstar. You&apos;ve clearly identified the actions and goals you want completed on the site. You&apos;ve tightened up your marketing and worked methodically on analyzing your conversion research and findings. You&apos;ve developed a testing roadmap based upon pages you&apos;ve scored, and from that you came up with dozens of tests to run. With confidence you jump in, create your first hypothesis and A/B test, and even create additional variants to test against your original page. You&apos;re ready to pull the trigger and start, but wait...something scary crosses your mind. What if I fail? Don&apos;t worry. This is a reasonable fear to have when you do this kind of work. The odds of you getting it right the first time around are against you, so be prepared to run several test rounds for each page. Remember, NOBODY knows for certain which test is going to work and testing is truly about learning, not winning or losing. Ultimately, some tests will win and produce a nice lift, while the majority will perform the same or even worse than the original. So what do you do, just give up? Of course not! Only 1 in 7 tests produce a winning variation. A recent study by ConversionXL observed that only 1 in 7 tests produce a winning variation. That&apos;s just a 14% win rate. Horrible, right? Wrong! What matters is that you learn from each test, update your hypothesis, pick yourself up, and get back in the ring and test again. With experience and time you&apos;ll start to create better hypotheses and ultimately increase your winning percentage. Losing a test also doesn&apos;t mean that you did something wrong, which is why you need to make sure everyone from the beginning understands that testing is about learning. No one ever increased performance by sitting on their hands and doing nothing. Rather, pat yourself on the back for getting out there and trying to make a difference ;). Bottom line is you can always learn a thing or two from failures. Results, good or bad, will always provide insights for further testing. Every year VisitPITTSBURGH runs a paid search promotional campaign as part of their "Pittsburgh is Kidsburgh" vacation package. The campaign focuses primarily on surrounding drive markets to help push ticket sales and hotel stays for local area attractions and hoteliers. As part of the campaign setup, Simpleview&apos;s paid media team did an analysis of visitor site engagement to see what visitor actions were like after clicking through a search ad. Additionally, the team wanted to know how many visitors were clicking through Visit Pittsburgh&apos;s site to the booking engine. Their findings showed that historically there were minimal click-throughs to the booking engine, which created an opportunity to increase ticket sales and hotel bookings for the campaign. Once the opportunity presented itself to optimize the landing page, our CRO team jumped in and identified friction points and barriers along the conversion path. Through a heuristic analysis of the site and an attempt to "book" a Kidsburgh package as a visitor would, the team identified the biggest point of friction was in the process of getting visitors to the Kidsburgh booking page. Combinations of tests were then created to see if click-throughs could be increased. The original layout of the landing page included step-by-step instructions (below) to reach the Kidsburgh package page through the booking widget. The beginning of theses instructions was unfortunately located below the fold of the landing page, and did not have a strong call to action. 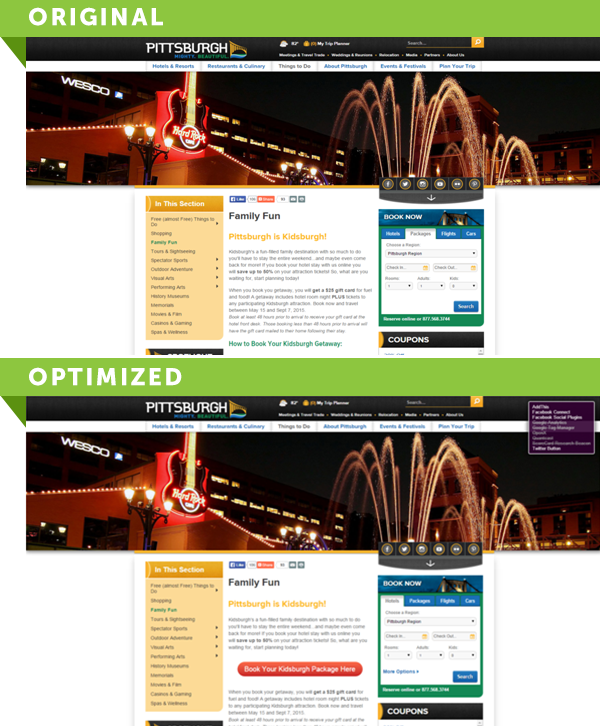 To alleviate this friction, the Simpleview team worked with VisitPITTSBURGH to create a button that was more visible (above the fold and high contrast with the colors of the site) and removed the additional steps needed to book a Kidsburgh package, creating a better flow for visitors by removing barriers that caused frustration. Since implementing this test, the new version of the page has seen a 254% increase in pageviews for the Kidsburgh package year over year. Did every test win? No, but both Simpleview and the client kept learning and tweaking our hypotheses to ultimately find the winning formula. More importantly, VisitPITTSBURGH enjoyed a 75% increase in package attraction tickets sales and a 70% increase in product revenue. Lastly, hotel bookings were also positively affected with a 103% increase in package hotel rooms and a 50% increase in product revenue. There are no secret recipes, formulas or magic tools that get you these kinds of results. You&apos;ll win some and you&apos;ll certainly lose some, but ultimately it boils down to hard work, tons of research, and a solid process to get the most out of your tests. I truly hope you&apos;ve enjoyed this series on conversion optimization and we would love to hear your thoughts and comments below. Simpleview offers a full range of SEM services including conversion optimization and testing. 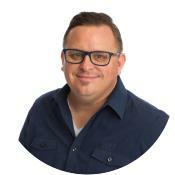 Please reach out to your account manager or Jason Swick directly to discuss solutions to fit your needs.